For doctors, the ability to diagnose diseases quickly is crucial so adequate treatment can be provided in time, particularly for fatal and infectious diseases. But making diagnoses can be a long-drawn-out affair because of the tests required. 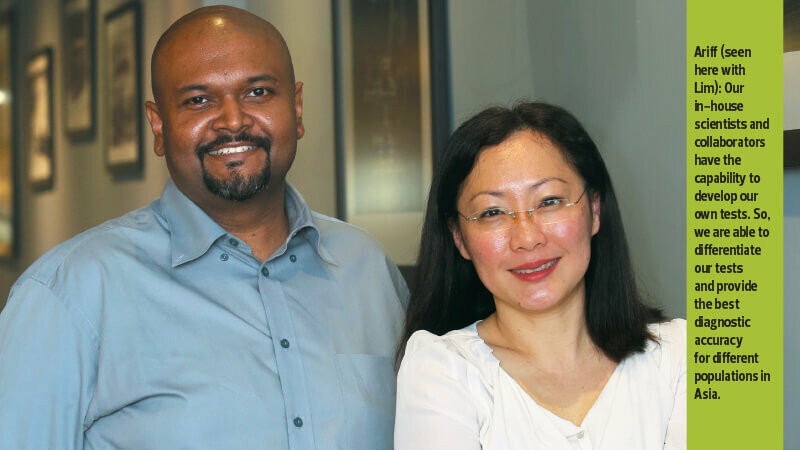 In 2012, Lim Li Sze and Ariff Ismail decided to set up diagnostics company Medical Innovation Ventures Sdn Bhd (Mediven) to tackle the problem. Through their former jobs as officers in charge of commercialising research at Universiti Sains Malaysia (USM), they had knowledge of available research as well as a network of scientists and business professionals to tap. They soon came across a technology that they could adapt into diagnostic kits capable of delivering quick and accurate results. Invented by a USM researcher, the thermostabilising technology for polymerase chain reaction (PCR) reagents enabled the transport of reagents (materials for a PCR reaction) at room temperature instead of sub-zero temperatures. While PCR had already been established as a useful tool for diagnoses, this innovation has made the distribution of PCR-based solutions cheaper and easier. “We saw this technology developed by a researcher from the health sciences department. At the time, there were things going on in the ecosystem that led us to feel that we were about to embark on something new and interesting, and we thought this was something worth embarking on. So, we decided to take this up and see how far we could go. Sure enough, five years on and we are still here,” says Ariff. Both he and Lim have a background in science. Executive director Ariff has a master’s degree in applied biomedical technology while operations director Lim has a doctorate in genetics. In their previous jobs, they specialised in commercialising research. “I learnt about a lot of technologies and also the problems they faced in trying to commercialise them. We did a lot of studies on different countries, on how they were successful and why some failed as well as what the best practices in technology commercialisation are,” says Lim. PCR is not a new technology, but its application in diagnosing common diseases in Malaysia was rare back then. On the other hand, international health groups such as the World Health Organization have recommended PCR as a fast and reliable tool to diagnose various diseases. “PCR is relatively new as a standard the international community has incorporated into policies. For certain diseases, we already use PCR as a matter of policy. For example, when we had the H1N1 bird flu in Malaysia, all the major hospitals in the country were equipped with the ability to test with PCR. But it was not used for the other diseases. They are slowly implementing it and that is where we come in,” says Lim. She adds that the government hospitals in every state have at least one PCR machine and many private hospitals are in different stages of adopting the technology. Lim and Ariff recognised the opportunities in the field. Relying on their relationships with researchers, they worked on producing test kits that could detect diseases such as dengue, zika, chikungunya, leptospirosis and tuberculosis. The company also employs in-house researchers to develop technologies or detect new diseases. “Our in-house scientists and collaborators have the capability to develop our own tests. So, we are able to differentiate our tests and provide the best diagnostic accuracy for different populations in Asia,” says Ariff. One of Mediven’s product lines is its Real-Time PCR kits. The way PCR works is that it detects specific DNA sequences unique to every organism. Ariff says the PCR-based technology that it uses is like the body of the key while the head is a primer that can be changed to identify those sequences. “It is not just organisms. There are certain codes and sequences that are species-specific and some are subspecies-specific,” says Ariff. The genius of the real-time PCR kits is that they are designed based on the symptomatic approach, meaning diseases with similar symptoms can be screened simultaneously. With just one drop of blood, the kits can identify about five DNA sequences. This is helpful if the diseases have similar symptoms — such as dengue, zika and chikungunya — or if a particular disease has many strains such as leptospirosis. Tracking more genes at a time will provide doctors with more information to make the correct diagnosis. The tests results, combined with on-the-ground investigation, can help authorities determine the source of an outbreak. Identifying the specific strain of the disease is helpful if there are multiple outbreaks or if different strains of the disease are more prevalent in particular geographic areas. “One of the problems many doctors in Malaysia and other countries have is identifying leptospirosis. Most of the time, we only find out that it is leptospirosis after the patient dies. Our kit is one of the best in the market because it can detect more genes and is able test for leptospirosis, whereas a lot of imported kits have failed,” says Lim. The doctor sends the patient’s blood sample to a lab where the DNA is extracted and inserted into a PCR machine. It produces results within hours, depending on the disease. The standard method of testing in hospitals involves culturing, where a doctor has to obtain a tissue sample from the patient and cultivate it in a petri dish. A confirmatory result may only be obtained after months because the presence of the offending pathogens has to be detected through observation. For example, it can take up to two months to confirm a tuberculosis diagnosis through culturing, whereas it takes only 2½ hours through Mediven’s real-time PCR kits. For TB, culturing is still a mandatory confirmatory test in Malaysia. A real-time PCR test is used as a screening test so doctors can take adequate action and prevent infection before the culturing results are obtained, says Lim. Another method is testing the level of antibodies in a patient’s body. Antibodies are produced as a reaction after the body has been infected. But it takes a long time for the antibodies to reach a detectable level. For instance, testing for leptospirosis using this method takes 7 to 10 days. Mediven’s kit, on the other hand, detects the infecting pathogen itself, so it only needs one to five days after the patient displays symptoms. “When you get infected, your body has been colonised by bacteria. There is a threshold it has to reach before it becomes detectable. PCR is useful because that threshold is a lot lower,” says Ariff. Another line of Mediven products is the Rapid Test, which detects diseases such as dengue, zika and rotavirus. It is an immunochromatographic test that identifies antibodies and antigens. Lim says there are similar products using this technology, but Mediven’s strength is its ability to design and develop new antigens and antibodies based on the different disease targets. “With rapid tests, you can use just a drop of blood to test for dengue. In Malaysia, the most prevalent strain of dengue is 2, followed by 3, 4 and 1. So, when we design tests, we need to adjust them so that they can detect dengue,” she says. The company regularly communicates with its customers, who are doctors on the ground, on the common disease strains in different localities. “We are changing the paradigm of personalised medicine as we are about the localisation of personalised health. The only way to do this is through diagnostics and early detection. The knowledge acquired through the deployment for various localised populations will provide differentiated strategies for better health management,” says Lim. The barriers to entry in biotechnology can be quite high as a substantial investment is needed to buy technology, intellectual property and equipment. So, there aren’t many Malaysian companies in this space. But despite the lack of competitors, Mediven has had to prove itself to prospective customers who may be unfamiliar with the technology. “There is some negative sentiment about made-in-Malaysia stuff as people tend to be a little sceptical, since they mostly buy things from the West,” says Ariff. Another problem Mediven faces is the lack of resources. Doctors need access to labs with suitable machines to use its kits. Although most hospitals already have such resources, it is still far from commonplace, especially in rural areas. “Not all doctors practise PCR because of budget issues. It is also relatively new in Malaysia,” says Lim. But most big hospitals and pathology labs already have the necessary equipment, she adds. Apart from supplying to local hospitals, the company exports its products to countries in Southeast Asia and the Middle East. To gain the trust of international customers, it has obtained global certifications and participated in external quality assessment programmes. Mediven complies with ISO 9001, ISO 13485 and the regulations set by the Malaysian Medical Device Authority, as well as international standards such as Quality Control for Molecular Diagnostics (QCMD) and the Royal College of Pathologists of Australasia (RCPA), says Ariff. “There are standards and regulations we have to comply with, especially in overseas and international markets, when dealing with diagnostics because it concerns human health,” he adds. Delivery Unit (Pemandu) to become an entry-point project under the Economic Transformation Programme in 2012. It hopes to get into the African market by the end of this year. The founders are keeping themselves busy by participating in exhibitions overseas and looking for international distributors. They reinvest a huge portion of the company’s earnings in development and marketing. Mediven currently has 20 employees. The founders say it has not been difficult to recruit qualified science graduates. “We take in interns from the universities. When they join us, they learn a lot because they can actually see science being converted into products,” says Lim. “There is a face to every kit. You are translating things from the bench to the bedside, where the patient is, and actually helping somebody out there,” adds Ariff.